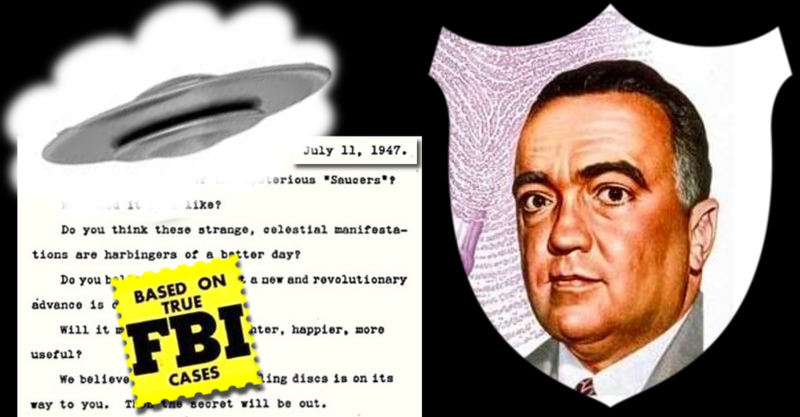 The FBI got into the UFO business in 1947, but they wanted nothing to do with it. In many cases, the FBI was stuck doing the legwork for low-level cases, chasing down rumors and hoaxes for the Air Force. They continued to do so up until 1950, but after that they were still occasionally involved mostly in investigating the people involved in UFO cases, most often Contactees or frauds - or both. The problem comes from the FBI material not clearly identifying the source, and worse, by failing to note the solution. We recently discovered another case that follows this pattern, but with a bit of research have matched it to newspaper reports to resolve the mystery. 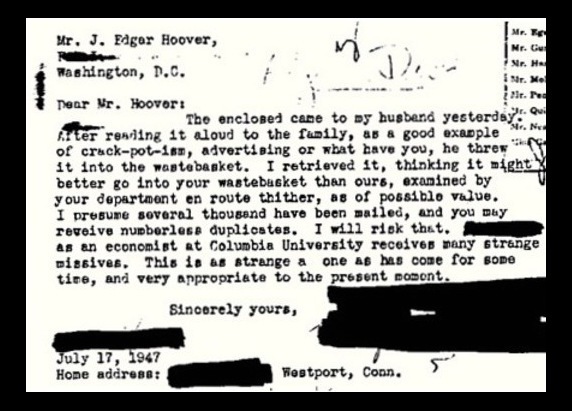 Many of the people who received the letter wrote to their local newspaper, and at least one citizen forwarded a copy to the FBI to see what they could make of it. 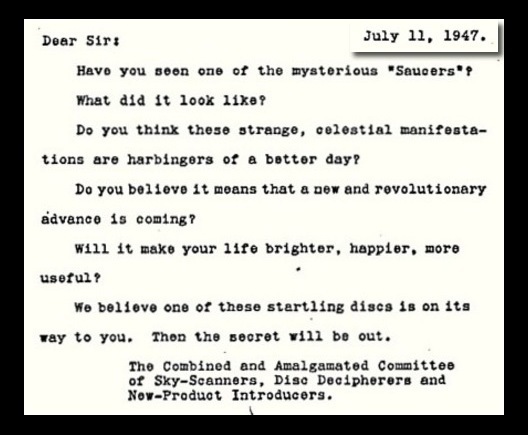 Have you seen one of the mysterious "Saucers?" Do you think these strange celestial manifestations are harbingers of a better day? Do you believe it means a new and revolutionary advance is coming? Will it make your life brighter, happier, more useful? We believe one of these startling discs is on its way to you. Then the secret will be out. (Signed) The Combined and Amalgamated Committee of Sky-scanners, Disc Decipherers and New-Product Introducers. 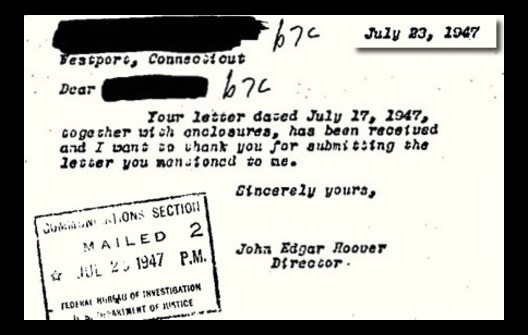 FBI Director J. Edgar Hoover replied to the informant, but merely offered thanks, not an explanation, and no clarification is contained in the files. Below is a simulation of the follow-up to the mysterious letter, and the newspaper clippings that clarify the mystery. 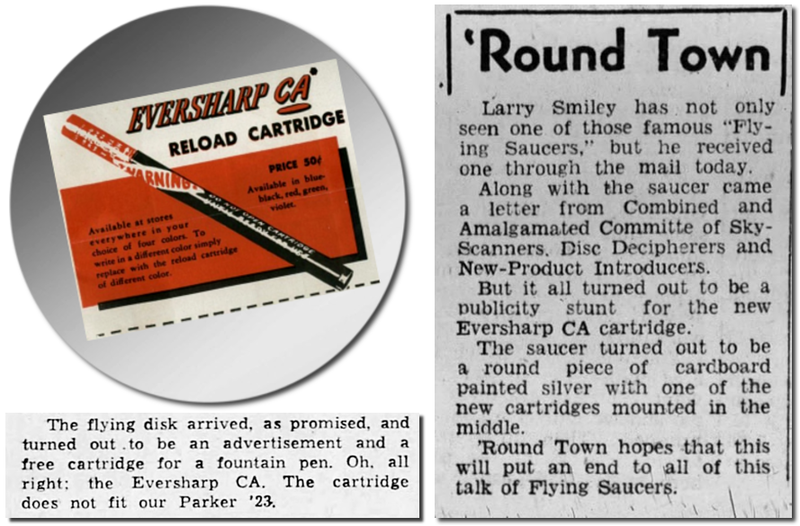 It was an advertising stunt for Eversharp CA, perhaps the first major company to exploit the flying saucer craze. They were the biggest, but not the first. Many smaller local businesses had beat them to it by commercializing saucers to promote anything from radio stations to hamburger stands. Here’s a look at the Eversharp CA, a pioneer in the ball point pen business. 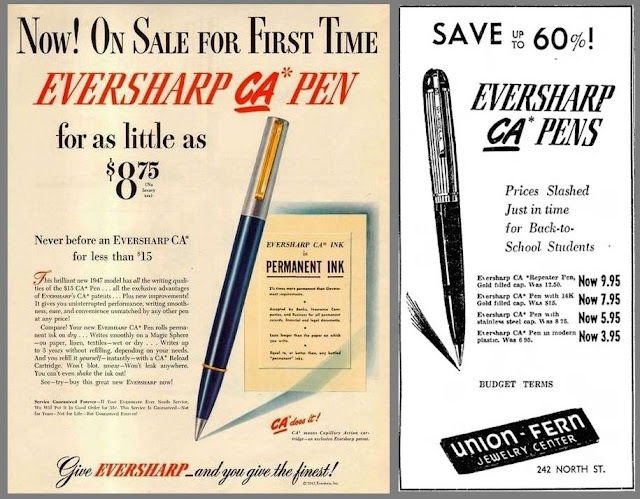 More on the company can be found in the article at Eversharp CA Ballpoint 1945-1947 at PenHero.com. The Saucers That Time Forgot stories, photos and blog posts may be shared by links, but STTF content is copyrighted, and reprints of articles or illustrations may not be published on other websites without permission. © Curt Collins & Claude Falkstrom. © Curt Collins, The Saucers That Time Forgot... Simple theme. Powered by Blogger.